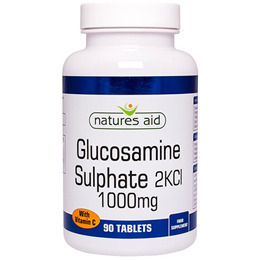 Glucosamine is a natural amino sugar present in the connective tissues of our body. Glucosamine plays a significant role in the construction of cartilage. Cartilage is the tough but flexible tissue that covers the ends of your bones at a joint. Healthy cartilage helps the body move by allowing bones to glide over each other. Cartilage also protects bones by preventing them from rubbing against each other. Glucosamine Sulphate 2KCl (product of crustaceans), Microcrystalline Cellulose, Vitamin C (as Calcium Ascorbate), Tablet Coating (Hydroxypropylmethylcellulose, Glycerine, Natural Colour: Titanium Dioxide), Anticaking Agent (Vegetable Source Stearic Acid), Hydroxypropylmethylcellulose. 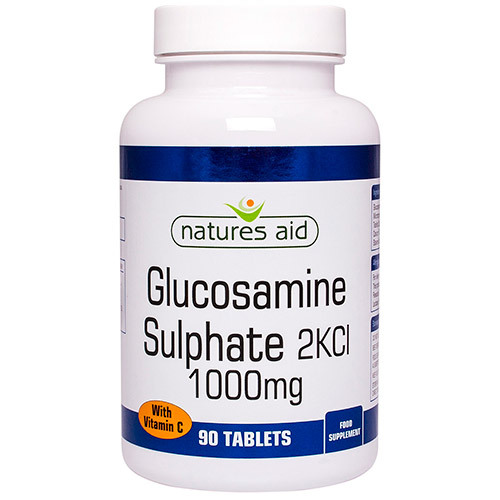 Below are reviews of Natures Aid Glucosamine Sulphate - 90 x 1000mg Tablets by bodykind customers. If you have tried this product we'd love to hear what you think so please leave a review.